We spent some time in Algonquin Park last week and had such a fantastic time. We love Algonquin and always cherish our trips there. We felt like we really hit the jackpot this year as we discovered a never ending field of wild blueberries and had several viewings of moose with their calves throughout the park. You really have no idea how huge a moose is until you see one up close. Let me tell you, they are gigantic! Even the sweet little calves are tall, thanks to their long, gangling legs. We couldn't believe how lucky we were to see several different mama moose with their baby in tow. We spotted all of them from the roadside. The one directly below was really close to the highway so we got some great photos. If you look closely, you can see all the flies or ticks all over her body. The girls are at such a great age right now (2 & 4) . Traveling is super fun with them. We have been bringing our bikes with us when we go camping this summer and spend a lot of time on them as a family. I bike with Little L behind me on the Trail-a-Bike and Hubby bikes with Little V sitting on the WeeRide Kangaroo Ltd. front mounted bike seat. We can get on trails that the Chariot didn't allow us to because it was too wide (we have a double) and most of all, the girls love the view from their new rides. Little L especially, just LOVES the Trail-a-Bike! I can't believe I don't have any pictures of her on it. I must get some soon! We parked at Mew Lake Campground and did the 10 km bike ride East, to Rock Lake, on the Old Railway Bike Trail. It was a beautiful trail, riding alongside many lakes. We stopped and had a quick lunch on Whitefish Lake. Little V was falling asleep and it's really not too safe to ride with her hanging over the handlebars so we rode the 10 kms back to Mew Lake at record pace. We stopped a short distance before the parking lot (after waking Little V) to enjoy the massive open field full of delicious wild blueberries. I had never even seen wild blueberry bushes until a few weeks ago when we were camping at Grundy Lake. We took the girls on a hike there and walked passed a few little wild blueberry bushes and marveled at how tiny they were (the blueberries and the bushes). We enjoyed eating the three or four blueberries we could find. 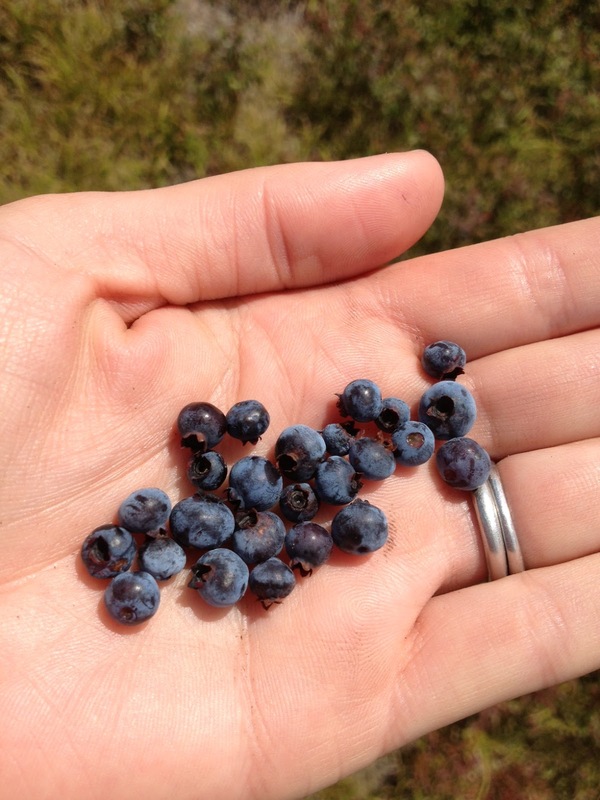 In Algonquin, there were a billion times more blueberries. Seriously! It was such a splendid experience. I felt so wonderful in the middle of this vast, open field, surrounded by forests and glorious blue skies and white fluffy clouds above. There, with my family, was heaven. To make it even more sweet, we all devoured as many blueberries as we could. They were magnificent! Like nothing I had ever had before. They truly are in a class of their own. Wild blueberries and domestic blueberries are not even the same fruit to me anymore! I quickly emptied my wide mouth water bottle and started filling it with fresh picked berries. The girls used their snack bags to hold their pickings. Little V had a hard time putting any in her bag. Most of them went straight to her mouth. And so they should! We picked enough to enjoy in pancakes the next morning and then on top of a yummy pavlova that I made when we got back to our house on the weekend. The only thing that would have made this experience more spectacular would have been to see a black bear enjoying the blueberries too. It would have been the perfect way to see one up close - with all that openness we could see one within a safe distance and we could hop on our bikes if need be and get to our car in a short amount of time. Maybe next year? !